A supposed screenshot from the game before it was released shows a very different experience. 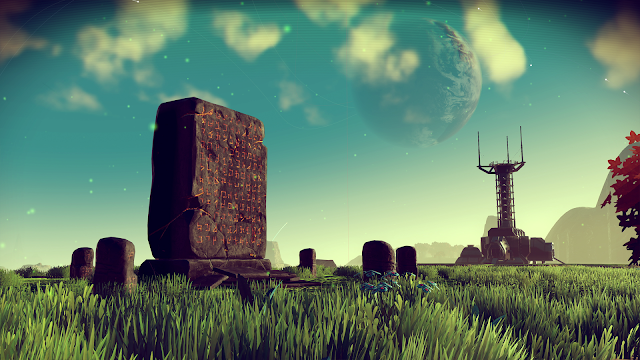 On Tuesday I wrote about No Man's Sky, the game that was supposed to be incredible. What we got was an incredible disappointment. Riddled with bugs and missing a ton of content that was supposed to be in the game already. Sean Murray and the rest of the Hello Games team have been conspicuously silent since the 18th when they said they are focusing on updating and adding features to the game. I've been trying to salvage some sort of experience from the whole debacle, and met with some success. The trouble is that I worry about whether or not I'm trying to make space lemonade out of space lemons, or if I'm just making excuses for a game that I desperately wanted to like love. Over the course of my experience with No Man's Sky, I've readjusted my expectations several times. I expect technical issues will be resolved, and that the game will improve as more content is added. I was fine with this line of thought, until I found out about the center of the galaxy. I'm not usually one for revealing spoilers, but I think it is very important that anyone thinking about giving No Man's Sky a try should know this from the get go. Even though Sean Murray claimed time and time again that there was something amazing at the center of the galaxy, once you get there, the only thing you get is a black hole that takes you to another planet somewhere else in another galaxy and breaks all of the technology you have. That's it. There is no great secret you learn there, no incredible piece of technology that you are given that changes the way you play the game, no portal to another player, no opportunity to design a creature, plant, planet, and no payoff for any of the alien species that you encounter along the way. It's essentially a huge reset switch and nothing more. Since learning about this part of the game, I've felt really let down. There is still a lot to see and discover and the art of the game is really beautiful. There is a great deal more however that feels empty, and not in space, where it should. So many planets have the same basic plants, there are only a few different skeletons for the animals on the planets, and there just doesn't feel like there is really any depth to speak of when it comes to the trade system or upgrading any of the tools in the game. It its best moments No Man's Sky is really beautiful to look at. If only it weren't just skin deep. The ships, while interesting to look at are nearly identical. Even the most basic upgrades to the multi-tool make you nearly unkillable in combat, eliminating the need for any more. The sentinels, which were supposed to be a formidable force of robotic police are barely aware of my presence as I plunder the resources of every planet I come across. Even when they are alerted, killing them is so easy that I would have to work harder to let them call for reinforcements. Still, I have soldiered on. I still fly from planet to planet, searching for new alien creatures to name and new elements to mine. I am still looking for newer and more interesting ships that I can buy or salvage. The problem is that I'm running out of justifications for doing it. Instead, I spend more and more time obsessing over one burning question. I feel that I am familiar enough with the game developer community to tell the difference between someone who has good intentions and someone that is out for money and nothing more. Sean Murray doesn't strike me as the kind of person that would intentionally mislead the community of fans just to make money. However, I can't ignore the sheer volume of missing content. To reiterate, when I say missing, I mean completely absent from the game, not even there in part. 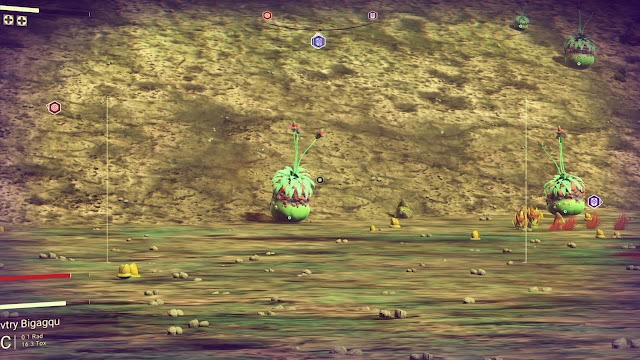 The most unique looking creatures I encountered look like plant-based Hoppity Hops. This leads me to the question: If this is the finished produce; a game that by all appearances resembles a game still in development, then what was Sean Murray and the team at Hello Games doing for three years? I understand that they have a small team, but I have seen small teams produce incredible amounts of work. Hell, look at what the team at Arcen games is able to produce. Their games are rich with content and deep customization with some of the most challenging AI I have dealt with in a game and they do all of this with a team of less than 10 people. There is too much missing from No Man's Sky to chalk this up to a bunch of devs getting in over their heads. Do I think that Sean Murray knowingly lied to fans and interviewers? No. I think that he and his team made a very very irresponsible decision by not communicating the real state of the game to people. As feature after feature was dropped from the game, there should have at least been a walk-back of advertised features. Instead, we got even more talk about elements of the game that do not exist in any tangible way. There are posts on the official site as late as August 8th that talk about and give links to videos of content that doesn't exist in the game at all. I don't think that Sean Murray is a bad or evil person. I do think that he made some very serious mistakes in how he chose to represent the game to people. 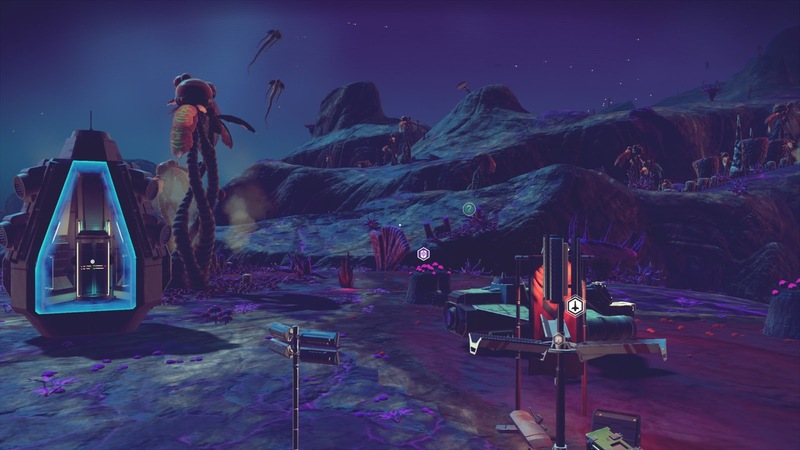 The decision to not talk to the community at all about what was being cut, trimmed or added has created a rift between Hello Games and the players so large that I expect it would be difficult for anyone to overcome. Furthermore, the near silence and refusal to talk about what went on during development is widening that gap day by day. 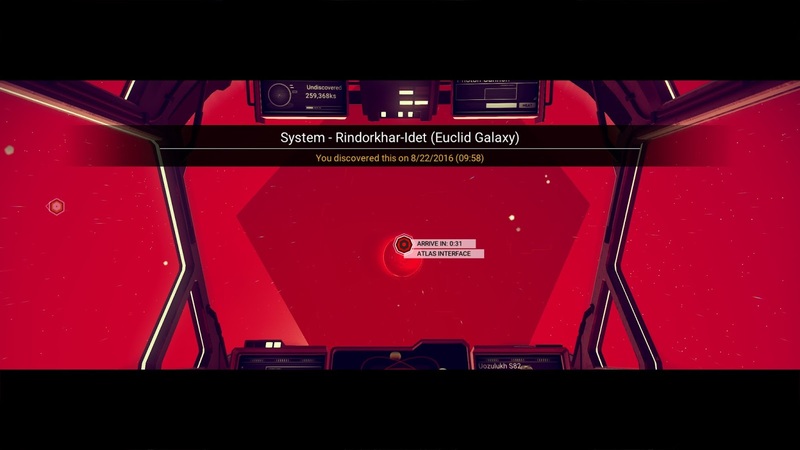 If Sean and the rest of the team at Hello Games wants to make amends for this debacle, someone has to come forward and talk about what happened. There will be ire and rage from a great many people who feel absolutely betrayed, but after all the poor decisions made in development; after having so many opportunities to set the record straight and not taking them, someone has to do the right thing.